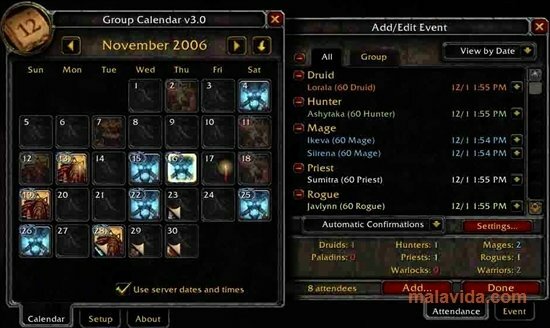 WoW Group Calendar is a plug-in for World of Warcraft in which we will be able to organize our events properly. The great social aspect offered by WoW, where players form part of brotherhoods, clans and groups, makes it essential for us to organize our things properly. Thanks to WoW Group Calender we can write down and share all kinds of events, from arrangements to finish a dungeon to the time and place where a meeting that we don't want to miss is going to take place. WoW Group Calendar is a shared calendar developed so that all the users that are part of the same brotherhood or group can keep any event synchronized, and thus manage to maintain a lot more order. 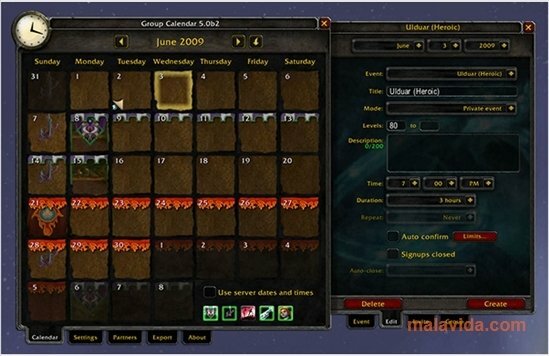 This plug-in is installed in World of Warcraft and is shown totally integrated into the interface, so using it won't vary the games great setting at all. 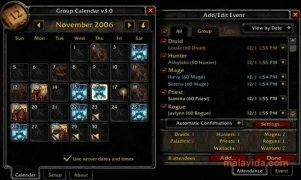 Everyone knows that Blizzard's game is one of the most important and complete and the fact that they continue adding updates and expansions make it a large world full of adventures to fulfil, so with WoW Group Calendar we will manage to organize ourselves better when it comes to exploring with a group. It is necessary to have World of Warcraft installed. This download requires a ZIP compatible compressor.